The extent to which the United States has been gripped by this World Cup was summed up by the image of President Obama watching live on board Air Force One. In the conference room of the Presidential aircraft, surrounded by snacks and accompanied by aides, Obama took in the along with some 19 million of his fellow Americans. 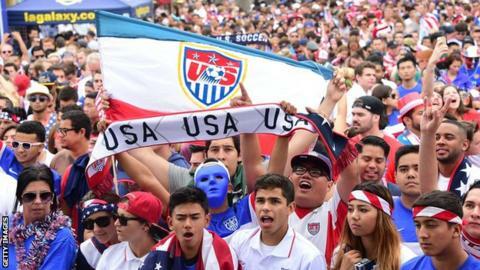 The US may have fallen for soccer like never before but there are still some elements of the beautiful game that do not sit comfortably with sports fans watching across the pond. The first is diving, or "flopping" as it is known in America. The second is the slightly fluid concept of stoppage time. There is no shot clock, no play clock. In football, nothing is quite that black and white. It is, however, the play-acting that is the biggest source of concern. Arjen Robben's admission that he dived during the Netherlands last-16 victory over Mexico has added fuel to this particular fire. "There are some players who act as if they've lost a limb when they get grazed by an opponent," wrote Nancy Armour in the USA Today newspaper. "Others spend so much time writhing on the ground it looks as though their jerseys are on fire. It's unbecoming and has to stop." The Wall Street Journal added: "Fans of the world's most popular game know that this is just one of soccer's oldest and most universally despised tactics." European and South American audiences have become battle-hardened to diving. In recent decades it has gone from being a source of moral outrage to an accepted part of the game, albeit one everyone would rather be without. There is a begrudging acceptance. Fans love the game; they find a way to overlook it. In the US, the practice goes against what many see as fair play. In ice hockey, fans are used to seeing their heroes hide injuries from coaches, not conjure them up to gain an advantage. In American football, players only tend to go to ground when they are thumped by a 20-stone linebacker. It is not a game that tolerates flopping. Basketball is, however, starting to see diving creep in, even if players are punished retrospectively. "Flopping has become more prevalent in the NBA," says Patrick Fishburne, a US fan on his way back to Chicago after a World Cup adventure in Brazil. "It is similar to what Arjen Robben did. He got a tap on the foot and his arms flew out." So angered was the Wall Street Journal by the diving taking place in this World Cup, they undertook a study to find out which team play-act the most. The newspaper calculated that during the first 32 games of the tournament, 302 players went to ground, apparently in pain. These theatrics took up a total of 132 minutes of "writhing time". According to the report, there were nine genuine injuries in a total of 302, leaving 293 cases of "simulation". The study showed one thing emphatically: the more you win, the more you flop. Teams who were winning were more than twice as likely to fake injury to waste time. Brazil had most flops; Bosnia the least. Matthew Palmieri, another US fan in Brazil, said he felt the American team would be less likely to indulge in the dark arts because of the reaction Stateside. He said: "I don't think the US team flops as much as the other teams because they know it wouldn't be something the fans back in the US want their team to do." That was an opinion echoed by half a dozen US fans on their way to Salvador for the last-16 match against Belgium. And yet the figures suggest something else. According to the Wall Street Journal, only six teams from the 32 in the group stage flopped more than US. The Americans suffered 12 "injuries" and chalked up six minutes, 24 seconds of "writhing time". Some fans believe the popularity of the game in the US is being damaged by diving. "I know a lot of people are put off by it," Fishburne added. "On Facebook there are a lot of people who are don't watch soccer regularly but are watching the World Cup. They are posting, 'if they quit the flopping, a lot more people would watch this in the US'." What is not widely known, it seems, is that US head coach Jurgen Klinsmann was once known as something of a diver during his playing days. In the 1990 World Cup final he caused controversy by getting Argentina's Pedro Monzon sent off before winning a penalty for West Germany that appeared to owe more to acrobatics than any kind of defensive aggression. In the 1994 Champions League semi-final he added to that reputation by writhing on the ground after a tackle from AC Milan's Alessandro Costacurta. Replays revealed no contact had been made. When Klinsmann joined Tottenham in August 1994, he won over many by making his goal celebration a swallow dive. The other major issue that the US is grappling with is not knowing when the match is going to end. In American Football and basketball, time is king. It adds to the drama, influences play. So what does that number mean again? A piece in the New York Times read: "No player on the field, no fan in the stands, no announcer on TV has any earthly idea as to when the last kick of the ball will come." Much of the disgruntlement and frustration began after to deny the US what would have been an incredible victory in their second game of the tournament. Americans cannot fathom that one man with a watch on his wrist knows when the game is up and no-one else does. They are, however, learning fast, with the US TV audience for the last-16 tie against Belgium expected to grow again. What no-one has considered is that the US supporters might have to wrestle with a moral dilemma that all football fans have experienced. What if one of their players dives to win a stoppage-time penalty that takes them into the quarter-finals? Perhaps that is when the US love affair with soccer will really be put to the test.